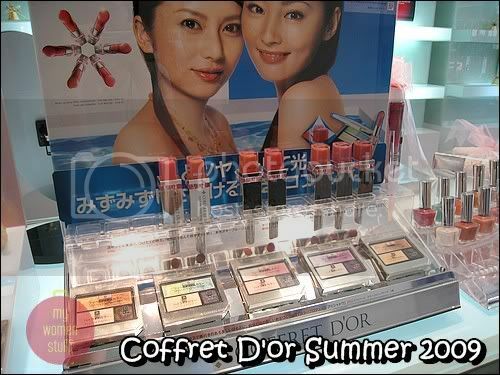 I was told by what I thought was a reliable source, that Coffret D’or would not bring in the Summer 2009 collection. I guess they were wrong because Coffret D’or’s Summer/Autumn 2009 Collection is here! Comprising 5 eyeshadow palettes and new lipsticks, this Coffret D’or collection is pretty and a more functional one compared to the previous Spring 2009 Shine collection. I checked out the CM Eyes eyeshadow palette which I found quite nice. They do swatch shiny and shimmery which I seem to notice is a trend favored by Japanese brands and Coffret D’or in particular. The colours too tend towards being light which some may not like but which I find are more user-friendly. Its harder to make a mistake with light shimmery shades than it is with strong pigmented colours. Here are pictures of the palettes. The colours are light and honestly, I feel that Coffret D’or looks to me like they are in a bit of a rut. The colour combinations look very similar in most collections. In fact, compare these with the 3D Lighting eyes and you will see lots of similarities. I’m happy with my 3D Lighting Eyes palettes and I find that the CM Eyes palettes swatch very similarly to the 3D Lighting ones so I will not be making a purchase. All that said, I must admit the looks done with this collection make the girls look so fresh-faced and pretty! I guess Coffret D’or is working with a formula they know works. My favourite look is #2 but then that blue-green eyeshadow just screams Paris B right? 😀 Have you seen the new Coffret D’or collection? Have you any thoughts on the eyeshadows or on Coffret D’or eyeshadows in general? PREVIOUS POST: 5 Sunscreen myths debunked! NEXT POST: Ask & Answer : How to use foundation to minimize wrinkles? I agree with you about Coffret D’Or being in a rut. 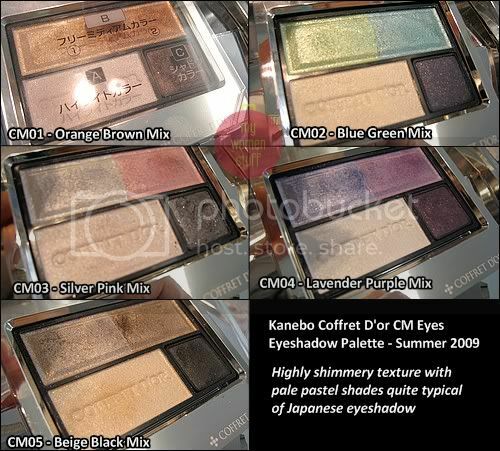 I am getting a bit bored with Japanese eye palettes, with the exception of Kate Diamond Cut Eyes. I just sold my latest Lunasol Sheer Contrast Eyes after using it just once! You are absolutely right about being bored – I am too! I have hardly checked out any Japanese eye palettes in a long time and they used to be a fave of mine. Now Western/European brands seem to catch my eye more. I wonder why! i wish they have something more interesting, and i don’t like the design of the palettes. bring back trance deep style? or the 3d lighting, i like those much better! Looks just like any other collection eh? I liked the texture but the colours were just too boring to justify getting any. The beige black one is not bad for a neutral look. I like the 02 Blue Green Mix, but this e/s palette reminds me of my 3D Lighting Eyes in 02 Blue Green Tones – and I have two of them because the SA told me Coffret D’or only sells a small, limited number here in my area. The collection is not yet here in Manila but I’m anxiously waiting for it. I might like it once I tried it – same thing that happened w/ SA eyes, as I took a liking into its 03 Green Tones once I applied it on a random visit at a Kanebo Counter. The neutral colors are indeed boring. The only thing different is the 03 Silver-Pink. What I’m waiting for is the new Eyeshadow Base from Coffre’t Dor, is it already available there in Malaysia? I have no problems w/ Coffre’t Dor e/s creasing and melting off, but I hope this base is as good as their foundation – w/c is great for my really oily skin – so that I can use that base w/ my other e/s.